Even with insurance, you can still benefit from these ways to save money with asthma. Asthma management isn’t cheap. You’re shelling out for maintenance inhalers, rescue inhalers, and often allergy medications — both prescription meds and over-the-counter antihistamines, decongestants, and eye drops — to help control your asthma triggers. That doesn’t even include what you’re spending on physician’s visits, emergency room visits, and asthma-related equipment, like nebulizers. Although insurance helps cut the cost of medications and provider visits, you still usually have some patient responsibility to shoulder. Plus, asthma costs add up over time because you have to take the medications regularly. “It’s not an antibiotic you take for 10 days,” says Jacqueline Eghrari-Sabet, MD, founder of Family ENT, Allergy & Asthma Center in Gaithersburg, Md. Recent U.S. statistics show the average per-person cost of asthma is $3,300 a year, a figure that combines medical expenses with missed days at work and school. 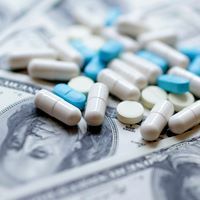 Unfortunately, these costs aren’t expected to dwindle anytime soon thanks to the growing number of people managing the disease — up from 7 percent in 2001 to 8 percent in 2009, or one in 12 people. But even with the rising numbers, there are ways to lower your asthma medication costs. Here are some suggestions from asthma treatment experts for how to reduce the cost of asthma medication. 1. Be up front about cost concerns. “Patients should be honest about what they can afford so we don’t have them walking out of the office with five brand-name medications,” says Marilyn Li, MD, director of the Breathmobile of Los Angeles County and the University of Southern California Medical Center in Los Angeles. If cost is a concern — and it may be an issue even if you have insurance, particularly if you have a high-deductible plan — your physician can work with you on some of the suggestions below. 2. Ask for generic alternatives if available. Generic drugs will cost less than brand-name. 3. Ask for samples to lower asthma medication costs. If your doctor’s office has samples, you can use those for a short period of time. When cash is a concern for you, your doctor may be able to offer an extended use of samples to sustain you until your next visit. 4. Look out for coupons. Your physician’s office may have coupons, vouchers, or rebates from the manufacturers of some of the most common asthma and allergy medications, says Dr. Li. You can also search online for coupons from some of the larger asthma medication makers, including GlaxoSmithKline and Merck. 5. Apply for patient assistance programs. The biggest asthma drug makers also have patient assistance programs, says Li. If your application to the program is accepted, it will cover or help cover your medication costs. There are usually income restrictions, and the programs are often geared toward people who do not already have insurance. 6. Consider allergy shots. For many people, asthma is triggered by allergies. With allergy shots, you visit your allergy doctor according to a schedule — one that often goes from weekly to monthly over a couple of years. “You ‘vaccinate’ against your allergy,” explains Dr. Eghrari-Sabet. “You get some long-term control, and some people even get permanent relief over allergies.” Allergy shots, also called immunotherapy, are more cost-effective than asthma and allergy medication taken over a lifetime, she adds. 7. Follow the treatment regimen your physician recommends. Your treatment for asthma may leave you reaching for your pocketbook a little more than you’d like, says Li. However, it will beat the alternative of missed school and workdays because of illness as well as the medical bills and copays associated with ER visits. 8. Make sure a member of your medical team explains how to use your asthma medication. On the surface, this may not seem relevant to saving money, and most providers are usually good about explaining how to use asthma medications. However, Li shares the example of a pediatric patient who was constantly in the ER even though his mom gave him asthma medication. After staff worked with her a little more on how to give the medication and how to use an Aero Spacer (a device that helps control the delivery of asthma medication), the boy’s asthma appeared well under control by the next follow-up visit. Better education on using your meds can help save time and money, not to mention get you better control over your symptoms.